"But if you're only giving the audience stuff they're familiar with, they're going to hate you. There has to be something new up there. And it's beyond my pay grade to figure out what it is. Everybody's burdened by that." Beyond Tom Hank's pay grade? Woah. I don't hate Tom Hanks at all but I certainly take his point. There has to be something new up there on the screen or at the very least, things we have seen but told from a fresh perspective. Despite the very obvious aspects of Spielberg's latest – peace is preferable to even a 'cold' war, living in America is far preferable to living anywhere near the Berlin Wall and mutual respect is a good thing – I really struggled to find something new. And Hanks is right again, it is a burden, a really heavy one on a filmmaker. The more famous the director, the heavier the burden which means Mr. Spielberg's shoulders are significantly weighed down by expectations given birth by his own early and spectacular roster of crowd pleasers and his mid-to-late career compulsion for serious artistic recognition. This is what I knew about Bridge of Spies before seeing it; it was Spielberg's latest, that its title is utterly lacklustre (unless I am missing something major), the film was inspired by real events during the height of the Cold War, it was about upholding the United States' Constitution against knee jerk prejudice and that actor Mark Rylance steals the show. I'm a few hours beyond its end credits and despite a very small number of remarkable moments, the film comes off as entertaining but relentlessly talky, dour and in one particular instance, overstated to the degree of actually infuriating me. Firstly, let's break that title down. 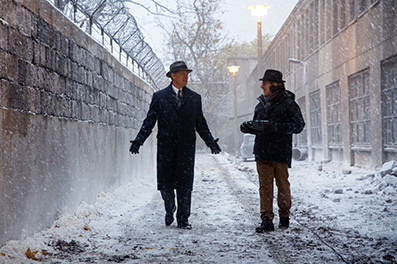 What does Bridge of Spies actually mean? The title of your movie is usually its first contact, a handshake offered to your potential audience. As a title, Jaws was fairly unequivocal. Big fish. Look at the poster. Got it? Close Encounters of the Third Kind scared Columbia's marketing team to death. But Bridge of Spies? Let's remove the literal bridge upon which these spies are swapped even though that may be the only meaning the filmmakers intended. Germany's Glienicke Bridge, it seems, is known as 'the bridge of spies'... Uh, OK. But is that it? Is it a metaphorical 'bridge' inhabited by crisscrossing spies so that peace and harmony can be maintained? Is it an allusion to 'bridge' the card game and the numerous moves that have to be made to win? I am betting that a publicity department worked for months trying to come up with a better title. It's a shame they failed. I came up with The Spy Trade (a simple double meaning). It's miles better than Bridge of Spies… However, book by its cover and all that. Colonel Rudolf Abel (a mannered and convincing Mark Rylance) is a Russian spy with what really sounds like a Scottish accent (!) once referred to as 'from the north of England'. Abel was born a Geordie (for our non-UK readers, it's a tough accent to get right emanating from the Tyneside district of northeast England). He spends his time painting landscapes in Brooklyn and picking up hidden coins with secret information contained within them. He is arrested and stays stoical about his fate despite the fact that U.S. public sentiment towards spies at the time (it is 1957) was so anti-communist, execution was seen as the de facto result of incarceration. But wait… If the great Constitution of the United States means anything at all, this man must be seen to receive a fair trial even though the circumstances and reality on the ground never suggest an iota of innocence. So how can he receive a fair trial and from whom? 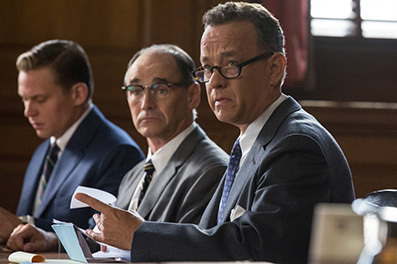 Enter insurance lawyer Jim Donovan (Tom Hanks), a civilian far from the murky world of politics and international power plays although he had prosecuted defendants at the Nuremberg Trials. Upon meeting Abel, Donovan is impressed by the man's quiet demeanour and intelligence and warms to him as a professional respecting another professional whose ethics from the 'Red' side of the table show just as much integrity as the very best spies doing the same job for Uncle Sam in Russia. Donovan is able to get the sure fire death sentence commuted to a jail term by suggesting that alive, Abel may be more useful to the government if an exchange of spies ever becomes a necessity. This doesn't play well with the average American and Donovan has to beat off C.I.A. agents, recalcitrant cops and trigger-happy 'Red'-haters. In the middle of all this is the setting up of another spy, this time an American pilot, Gary Powers, who's charged to take photos over sensitive Soviet areas. There's no mystery to solve here. As soon as his plane is hit, you know he's the corresponding spy swap for Abel. This exciting scene really feels like it's elbowed its way in from another movie being so much more kinetic and 'modern' than any scene in the film has been up to this point. Needless to say, the effects work is exemplary. I just wish I'd cared a little more. Despite the universal acclaim the film has picked up, ironically for qualities I've always championed (good old fashioned filmmaking technique and thespian excellence), I found it hard to care for the two men at the centre of the drama despite being aware of how subtle and contained their performances were. Character layering is not Spielberg's forte but with Ryland, it seems as if he's found an actor who comes pre-layered. They are built in to the man in the same way that gravitas follows Morgan Freeman around like a stately cloud. Hanks is no pushover (after all, he is the star of the piece) and his performance is naturalistic, easy on the eye and chock full of integrity. But Bridge of Spies never thrusts into a strong enough third gear for me and I am willing to concede that this had very little to do with the filmmakers and everything to do with me given how positive the other reviews have been. I'm missing something but cannot put my finger on what that might be. Again, like my feelings toward Spectre, it may be a complete lack of surprise. There is one moment of stunning shock and much later one shot that annoyed me and they both sort of cancelled each other out in the same way that in Jeremy Scott's You Tube hit Cinema Sins, a great moment will knock off a sin from a previous moment. I'll try and keep this paragraph spoiler free by being vague but in the middle of the film, you are successfully lulled into a really false sense of American domestic torpor. Suddenly something happens to break that languid mood. I was calmed so well and brought out of that reverie with such a shocking intensity that I actually believed for a split second that something had gone horribly wrong in the building in which I was sitting. That is terrific filmmaking by anyone's standards. Completely at the other end of the scale was what promised to be a moment of sublime subtlety. In fact I was congratulating the writer and director in my head when two shots later he delivered one shot too many and that subtlety morphed into a sledgehammer. It was like being told a joke and getting it before the punch line. Hanks witnesses an event in East Germany. It really affects him as it would any decent person. On a similar train with a similar view when he's made it back home, Hanks stares out of the window and in one simple shot, we suddenly understand the gulf between where he's been and where he is now, the difference between the shocking horror of life behind the 'Iron Curtain' and the comparison with America, the land of the brave and free and I use those words with little irony. Spielberg then gives us an extra shot directly mirroring the event witnessed in Europe, essentially excising all of my previous admiration for subtlety. What I thought was a cultivated light touch turned into over-simplification and it was such a shame. But then as my partner remarked to me, Steven Spielberg does not make films for me but for the masses. And while I would be content with an allusion and the shadow of an idea, 'Joe Public' needs the spoon and the pap contained in its bowl rammed down its throat to 'get it'. This annoying overstatement is a feature of the same filmmaker's Munich. This is what still denies Spielberg any real 'auteur' status. He's too much of an audience-pleasing filmmaker, terrified that ideas may go over some heads and that's no bad thing in most cases. Bridge of Spies is solidly entertaining and features top notch performances and one action scene superbly directed and excitingly cut by Michael Kahn and is an intriguing slice of history as strained through the Spielbergian colander of simplification and need for audience identification. Bereft of a sick John Williams, Spielberg turns to composer Thomas Newman who does a sterling job with a patriotic and warm orchestral score suffused at times with musical idioms familiar as 'Russian'. It sounds like he did his research listening to John William's score for Oliver Stone's JFK. But for all of the film's virtues, I couldn't fully engage emotionally. If you'd played me this film in a bubble of ignorance I would not have been able to identify it as a Steven Spielberg film (perhaps that unwanted shot I mentioned would have been my only clue) and I certainly would not have identified Joel and Ethan Cohen's hands on the screenplay originated by Matt Charman. In fact, it irks me when critics 'notice' the work of certain people whose names are well known to them. It's fraudulent reverse engineering and just because Rylance's spy replies with the same plaintive "Would it help?" to Hank's concerned lawyer three times throughout the film, some people have been saying that this confirms the Cohen brothers' involvement. Does it? Really? Still, if you're up for a solid spy drama and desperate to avoid Snoopy and the plethora of Christmas movies, then cross this Bridge when you come to it.